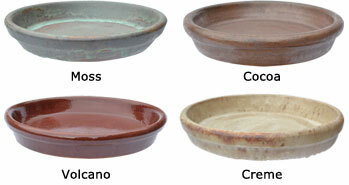 High Fired glazed saucers match all the #WS Mexican Glazed Pottery. Only available in 2 sizes & 4 colors. All colors are matte finish except Volcano which is high shine. Don't undersize your saucers. You want to make sure they will catch any water overflow. 21 $90.00 21.00" 17.00" 3.50"
23 $99.00 23.00" 19.75" 4.00"